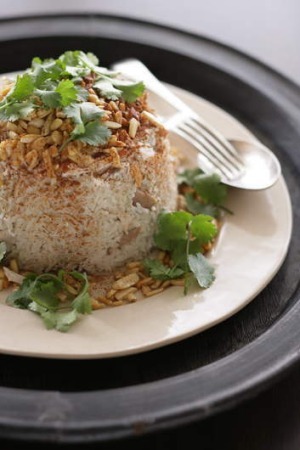 Serve with a side dish of yoghurt, and fresh coriander and mint. Wash the rice well in a colander until the water runs clear then place in a bowl with 1 tablespoon of salt and cover with lukewarm water. Soak for at least 1 hour. Wash the chicken and place in a pot and cover with cold water. Add 1 tablespoon of salt, the cinnamon, carrot, celery and half an onion. Bring to the boil and simmer gently for about 1 hour or until the chicken is tender. Meanwhile, fry the chopped onion in 30g butter until soft and golden brown and set aside. Fry the pine nuts and almonds separately in the extra butter until golden brown and drain on kitchen paper. Remove chicken to a plate (reserving the liquid) then shred into pieces when cool enough to handle but still warm. Bring 2 1/2 cups of the chicken liquid to the boil and add the drained rice, three-quarters of the chicken, sauteed onions, allspice and pepper. Stir to combine and reduce heat to a low simmer and cook uncovered for 20 minutes until the rice is tender. Brush a serving bowl with the olive oil and arrange some of the nuts and the reserved chicken on the bottom. Spoon the cooked rice over them and press down. Turn out the mould onto a serving dish, and sprinkle with cinnamon.